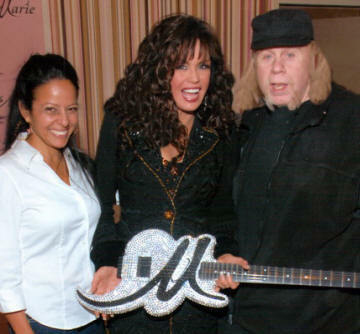 Marie Osmond Actually Designed This Guitar. She Is Incredibly Artistic, She Involved Herself Fully In The Project From Beginning To End !!! Mike Risinger Did All The Body Carving & Re-Carving & Marilyn Simms (Left) Did All The Jewelling. I Met With Marie Myself 7 or 8 Times During The Design & Prototype Phases. This Guitar Holds The Record For Design Changes !!!! We Drove The Guys In The Shop Crazy But We Had A Lot Of Fun !!! During The Designing Process I Got To Know Marie Quite Well. She Is A Wonderful & Caring Person, I Hope To Work With Her Again On Her Next Guitar Project. It Was A Real Privilege To Get To Know Donny & Marie I Can Really See Why They Are Icons. Currently Their Show Which Has Been Running In Vegas For 2 Years Is Packed Every Night. The Show Is Currently The Best Musical Revue On The Strip, I Really Recommend It !!! I Don't Care If You Are A Metalhead Or A Rocker Or Just A Budding Musician, You Will Like It !! I Have Seen The Show 10 Times, I Think It Gets Better Every Time. Marie's Voice Is Amazing !!!! I Have Taken A Number Of Doubters To This Show ! And They Always Leave Shaking Their Heads In Amazement !!! Ed Roman Predicts, This Show Will Be Running For A Long Time In Vegas !!! 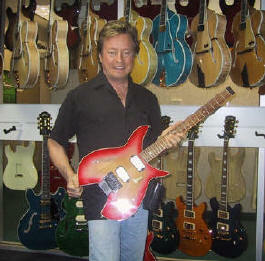 Rick Derringer with his LSR Custom before it was finished being built. These photos were before we did the electronics. 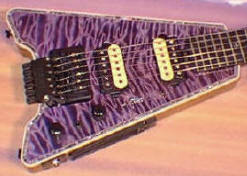 This Headless Custom 12 string eventually went to Steve Morse. 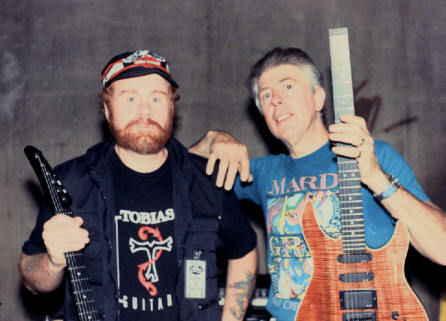 I was still working for Steinberger when this photo was taken. Custom Built For Randy Pratt From "Cactus"
"As Phat As It Gets"
Leslie has his own model, This one is actually an exact copy of the first one that we built for Eddie Van Halen. Leslie uses this one as much as he uses his own model. He also has a Blue one & a Black one. "Eddie Van Halen endorses Charvel Guitars"
Wooden Necks come in Solid Rosewood, Maple, Macassar Ebony, Koa, Mahogany & More. Different Guitars, Different Pickups & Different woods. 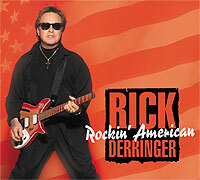 One of Ed Roman's favorite all time guitarists. 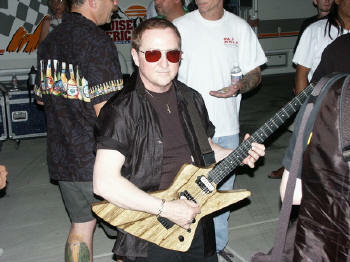 When we made the original run of LSR guitars we made them very fancy. Heavily Quilted, Wild Paint, Fancy Inlays, etc etc. This one was made from solid Korina and was built to a very tasteful minimalistic standard. Available in many colors !!!! 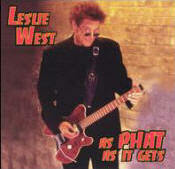 This is the latest Leslie West model, Leslie calls it the Rocket !!!! 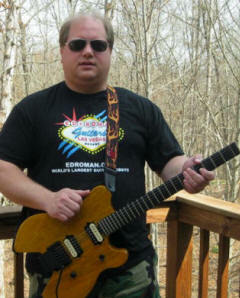 This Original Pre Gibson Steinberger Guitar was Leslie's Main Axe for more than 12 years. 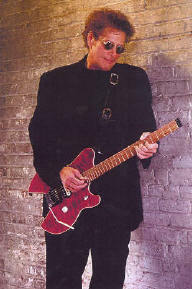 Upon receiving his first LSR In 1998 Leslie demoted this to 2nd guitar. He completely retired it in 1998 in favor of the EB-1 like Eddie's. 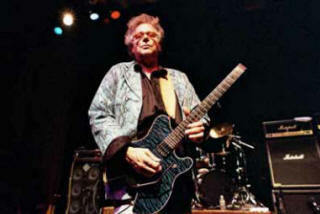 The Leslie West Rocket Model (above) was still on the Horizon at that time. 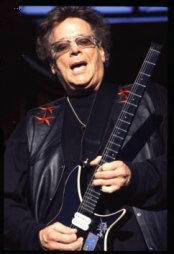 This is the Original Leslie West LSR Model. 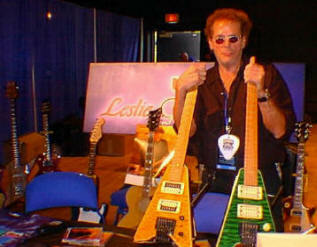 Many of them had "Leslie West" inlaid in the wood just below the pickups. This was patterned off the old Steinberger that he used for 12 years. 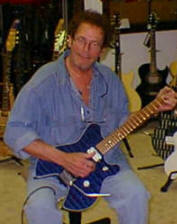 When Leslie first got this guitar he gave one of his old Steinbergers to Eddie Van Halen. Incidentally Leslie was one of Eddie's early influences.